Now Available With 3 New Vertical Pocket Layouts! 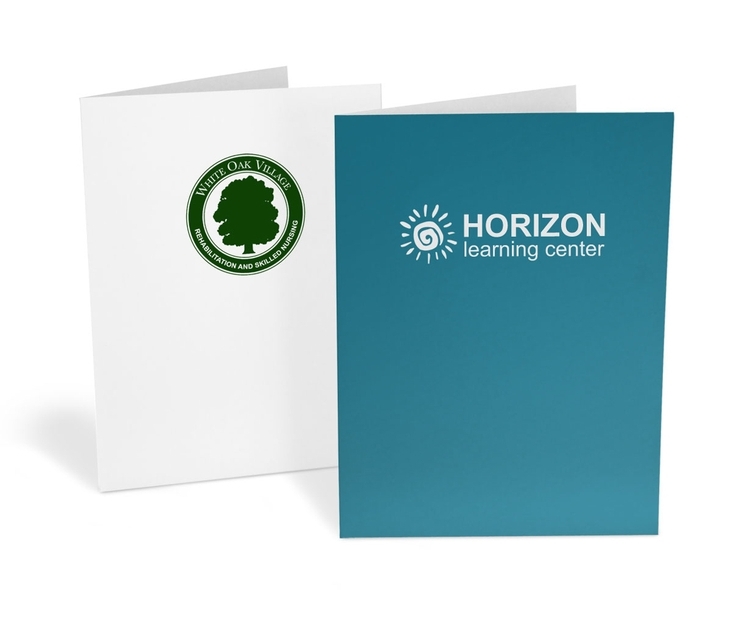 9" x 12" USA Made Presentation Folders printed in one ink color on 12 pt. Coated White Gloss Stock stock with your choice of 23 stock layouts, 9 business card and 2 USB die-cut slit options. Prices include one color full edge to edge (bleed) ink coverage on front cover, back cover and inside 4" pockets. Free Aqueous coating on coated papers. See “Options” for 46 paper stocks in Classic, Designer & Premium papers and other styles for 2, 3 and full 4 color process printing. Embosssing, Soft-Touch finish and inside printing available. Foil Stamped, Budget, Legal Size, Mini Size, Small Quantity, Stock Design and "Splash" style Folders are also available, see other styles. COLORS: White Gloss 12 pt. Coated paper stock is standard, choose from 46 additional paper styles, see pricing below. IMPRINT: 1 color unlimited ink coverage on front cover, back cover and inside 4" pockets is included in this price. NOTE: 2, 3 and full 4 color process printing is available at an additional charge, see other styles.